Now it's the time for grill, BBQ and skewers in Middle east. The weather is perfect for the lazy outdoor gathering with friends and relatives. We can see plentiful opportunities for barbecue in beaches, parks and in most of the places in UAE. An evening with our friends and family having some simple chit chats, fun and with a great dinner alternative is something very treasured moments in the life of an emigrant. So i thought of sharing some special party ideas for such gatherings. 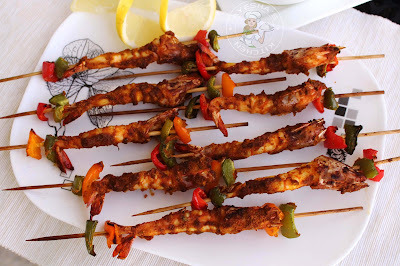 This is a perfect meal for a kids party food or for a simple family get together. Last weekend, i feel little bit lazy in cooking and was looking for something to make that is simple but delicious, easy yet impressive and special. And here is it, the shrimp grilled in an oven. 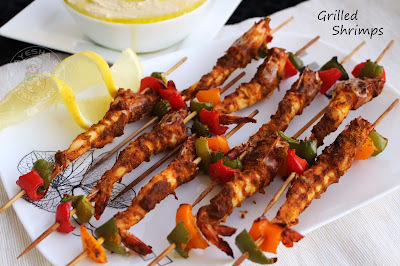 This is an easy shrimp skewers recipe with my favorite ingredients. I love cooking with shrimp and squid. I am also a huge fan of shrimp rice and stuffed calamari rather than a simple prawn curry/shrimp curry or roasted squid. As a blogger, i dislikes cooking the same recipe all the time especially with seafood. I prefer grilled fish / grilled seafood than a pan fried one. The best way to cook shrimp is grilling them on skewers, i think. These beautiful jumbo prawns look perfect for grilling and so I put them on skewers along with some cubes of bell peppers that makes a perfect dinner meal. The shrimp skewer marinade I used here is a typical Indian spicy prawns/shrimp marinade recipe. I served this grilled shrimps alongside with Pita bread, Garlic bread toast , Lemon herb chicken, hummus and a fresh cocktail. It was an irresistible dinner ever. 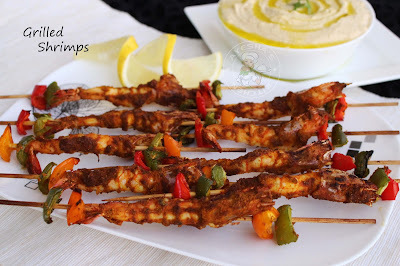 Here is the recipe showing shrimp recipes on the grill/shrimp on grill recipe /grilled shrimp skewers/jumbo shrimp recipe / easy healthy shrimp recipes/head on shrimp recipe. Do try this best-grilled shrimp recipe and have a memorable shrimp dinner. Clean the shrimps well and let the head and tail on for a lovely presentation. Gently clean the shrimp head under tap water. Drain it well. Take all the ingredients given under prawn marination in a blender except oil and blend it until smooth. Then add oil and again blend well to a fine thick puree. No need of adding water. Now marinate the prawns/shrimps with this thick marinade. Take a skewer and skewer the prawns from the head to the tail with care. Add the bell peppers in between. Keep refrigerated for 10 minutes. Now, coat the skewered shrimp with cooking oil/butter . Grill it in the oven at 180 degree C for 10 - 15 minutes or until done. Turn in between. Temperature and timing may vary upon the oven u used. So keep an eye on it. Serve hot along with garlic bread, hummus and any fresh juice. Enjoy the yummy flavorful grilled shrimps in skewers.